"War" is a counterculture-era soul song written by Norman Whitfield and Barrett Strong for the Motown label in 1969. Whitfield first produced the song – an obvious anti-Vietnam War protest – with The Temptations as the original vocalists. After Motown began receiving repeated requests to release "War" as a single, Whitfield re-recorded the song with Edwin Starr as the vocalist, with the label deciding to withhold the Temptations' version from single release so as not to alienate their more conservative fans. Starr's version of "War" was a No. 1 hit on the Billboard Hot 100 chart in 1970, and is not only the most successful and well-known record of his career, but it is also one of the most popular protest songs ever recorded. It was one of 161 songs on the Clear Channel no-play list after September 11, 2001. The song's power was reasserted when Bruce Springsteen and the E Street Band took their rendition into the U.S. Top 10 in 1986. It was also covered by Frankie Goes to Hollywood in 1984 and more recently by the Rock band Black Stone Cherry on its 2016 album Kentucky. The Temptations' version of "War", featuring Paul Williams and Dennis Edwards on lead vocals, was much less intense than the Edwin Starr version. Williams and Edwards deliver the song's anti-war, pro-peace message over a stripped-down instrumental track, with bass singer Melvin Franklin chanting a repeated recruit training-like "hup, two, three, four" in the background during the verses. The song was included as a track on the March 1970 Psychedelic Shack album, which featured the title track as its only single. The track's direct message, summarized by its chorus ("War, what is it good for? Absolutely nothin'! "), struck a chord with the American public and resonated with growing public opposition to the war in Vietnam. Fans from across the country, many of them college students and other young people, sent letters to Motown requesting the release of "War" as a single. The label did not want to risk the image of its most popular male group, and the Temptations themselves were also apprehensive about releasing such a potentially controversial song as a single. The label decided to withhold "War"'s release as a single, a decision that Whitfield fought until the label came up with a compromise: "War" would be released, but it would have to be re-recorded with a different act. 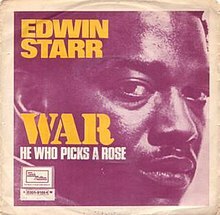 "He Who Picks a Rose"
(1970) "Stop the War Now"
Edwin Starr, who had become a Motown artist in 1968 after his former label, Ric-Tic, was purchased by Motown founder Berry Gordy, Jr., became "War's" new vocalist. Considered among Motown's "second-string" acts, Starr had only one major hit, 1968's No. 6 hit "Twenty-Five Miles", to his name by this time. He heard about the conflict surrounding the debate of whether or not to release "War", and volunteered to re-record it. Whitfield re-created the song to match Starr's James Brown-influenced soul shout: the single version of "War" was dramatic and intense, depicting the general anger and distaste the anti-war movement felt towards the war in Vietnam. Unlike the Temptations' original, Starr's "War" was a full-scale Whitfield production, with prominent electric guitar lines, clavinets, a heavily syncopated rhythm accented by a horn section, and with The Originals and Whitfield's new act The Undisputed Truth on backing vocals. Upon its release in June 1970, Starr's "War" became a runaway hit, and held the No. 1 position on the Billboard Pop Singles chart for three weeks, in August and September 1970. It replaced "Make It With You" by Bread, and was itself taken out of the spot by another Motown single, "Ain't No Mountain High Enough" by Diana Ross. Billboard ranked it as the No. 5 song of 1970.
Notable as the most successful protest song to become a pop hit, earning compliments from contemporary protester John Lennon, "War" became Edwin Starr's signature song. Rather than hindering his career (as it might have done for the Temptations), "War" buoyed Starr's career, and he adopted the image of an outspoken liberal orator for many of his other early-1970s releases, including the similarly themed "Stop the War Now" from 1971. It and another 1971 single, "Funky Music Sho' 'Nuff Turns Me On", continued Starr's string of Whitfield-produced psychedelic soul hits. After 1971, Starr's career began to falter, and, citing Motown's reliance on formulas, he departed the label in the mid-1970s. Later in his career, after moving to the United Kingdom, Starr re-recorded several of his hits with British band Utah Saints. Starr's new version of "War" in 2003 was his final piece. He died on April 2 of the same year of a heart attack. Starr earned a Grammy nomination in 1971 for "War" for best R&B Male Vocal. In 1999, Starr's recording of the song was inducted into the Grammy Hall of Fame. in the TV spot to City Slickers, Tropic Thunder, South Park: Bigger, Longer & Uncut. The song is featured in The Simpsons episode "Treehouse of Horror VIII," in the segment "The Homega Man". After Springfield is attacked by a French nuclear weapon, Homer, seemingly the only person in the city not killed or mutated by the explosion, is seen dancing completely naked to the song in a church. A couple of lines are briefly spoken by Stewie Griffin in the Family Guy episode "Bigfat" as he is attempting to help reorient Peter to civilized life. Peter correctly supplies an appropriate grunt. Starr's version of "War" is featured in a 2015 TV commercial for the Nissan Rogue. A truncated version of Starr's original recording was used as the opening theme to the TV drama Family Law (1999 – 2002). The song is referenced in the Seinfeld episode "The Marine Biologist" where Jerry convinces Elaine that Tolstoy's original title for "War and Peace" was "War, What Is It Good For?" (1984) "The Power of Love"
Frankie Goes to Hollywood followed their debut 1983 UK number one single Relax with Two Tribes. The principal B-side for 12-inch single was a cover version of "War". To build on the chart success of "Two Tribes", "War" became the subject of an accomplished extended remix in its own right (subtitled "Hidden") for the third version of single's UK 12-inch. For the release "War" was promoted as a double-A-side with the "Carnage" mix of "Two Tribes" on the reverse. The 12-inch double-A-side single was released in standard and picture disc versions, both with the ZTT Records catalog number WARTZ 3. Versions of both "Two Tribes" and "War" would later appear on the group's 1984 debut album Welcome to the Pleasuredome as well as numerous Frankie Goes to Hollywood and ZTT Records compilation albums. 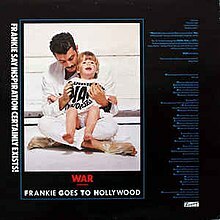 The release of "War" / "Two Tribes" also coincided with an extensive and iconic T-shirt marketing campaign for the band during the summer of 1984, featuring such slogans as "Frankie Say WAR! Hide Yourself", as pictured on the 12" single cover. Several lines of spoken dialogue were added to the Temptations/Edwin Starr version of the song. Impressionist Chris Barrie voiced the long soliloquy about war and love, while impersonating the American President Ronald Reagan; a role he would later reprise in the hit UK TV Show Spitting Image. Born in Germany, Barrie translated and subversively quoted Adolf Hitler from his failed 1924 putsch trial, in the first new lines added to the song. 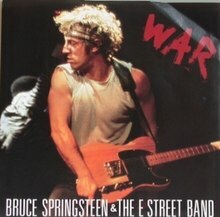 "War" was performed in concert by Bruce Springsteen and the E Street Band in 1985, added to the set list for the final few shows of their lengthy Born in the U.S.A. Tour. Springsteen and his manager Jon Landau were looking for a way to make these concluding shows, taking place at the Los Angeles Memorial Coliseum, a little different and special, and Landau suggested playing "War". A year earlier, he had suggested the same, as a loose protest against Reagan Administration foreign policy in Central America and elsewhere, but the band had been unable to come up with an effective arrangement. This time, however, they did. Springsteen taped the words of the song to his arm, prefaced the song with a spoken admonition not to blindly trust the government, leaders or anything else, and then he and the band performed a rock rendition. Springsteen released the September 30, 1985 performance as a part of his 1986 box set, Live/1975–85. "War" was chosen as the first single from the set, and it was again a big hit, reaching No. 8 on the Billboard Hot 100 chart. The music video for the single was a straight concert filming of the same performance. Springsteen continued to perform "War" regularly through his 1988 Tunnel of Love Express and Human Rights Now! Tours. He then retired it, until again performing it on his 2003 Rising Tour before and during the start of the Iraq War. The Jam released a version of "War" as one of the b-sides to their 1982 single "Just Who Is the 5 O'Clock Hero?". That version is available as a bonus track on reissues of their 1982 album The Gift. Also in 1982, Vancouver punk band D.O.A. released a version of "War" as the title track of their EP War on 45. The song was covered in the 2010 film Gulliver's Travels starring Jack Black. ^ "It's the End of the World as Clear Channel Knows It". Slate.com. 2001-09-17. Retrieved 2014-07-19. ^ "Grammy Award Nominees 1971 - Grammy Award Winners 1971". Awardsandshows.com. 1971-03-16. Retrieved 2016-10-03. ^ "Ultratop.be – EDWIN STARR – WAR" (in Dutch). Ultratop 50. ^ "Library and archives Canada". Collectionscanada.gc.ca. Library and Archives Canada. Retrieved 2015-12-30. ^ Hung, Steffen. "germancharts.com - Edwin Starr - War". germancharts.de. Retrieved 21 March 2018. ^ a b "The Irish Charts – All there is to know". IRMA. Retrieved 2017-12-30. ^ "Dutchcharts.nl – Edwin Starr – War" (in Dutch). Single Top 100. Retrieved 2017-12-30. ^ "Norwegiancharts.com – EDWIN STARR – WAR". VG-lista. ^ "EDWIN STARR - full Official Chart History - Official Charts Company". www.officialcharts.com. Retrieved 21 March 2018. ^ "EDWIN STARR Chart History (Hot 100)". Billboard. ^ "Item Display - RPM - Library and Archives Canada". collectionscanada.gc.ca. ^ "25 Years On: Frankie Goes To Hollywood's Welcome To The Pleasuredome". The Quietus.com. Retrieved 8 June 2018. ^ "Ultratop.be – Bruce Springsteen & The E Street Band – War (Live)" (in Dutch). Ultratop 50. Retrieved 2015-12-05. ^ "Musicline.de – Bruce Springsteen & The E Street Band Single-Chartverfolgung" (in German). Media Control Charts. PhonoNet GmbH. Retrieved 2015-12-05. ^ "Dutchcharts.nl – Bruce Springsteen & The E Street Band – War (Live)" (in Dutch). Single Top 100. Retrieved 2015-12-05. ^ "Charts.nz – Bruce Springsteen & The E Street Band – War (Live)". Top 40 Singles. Retrieved 2015-12-05. ^ "Norwegiancharts.com – Bruce Springsteen & The E Street Band – War (Live)". VG-lista. Retrieved 2015-12-05. ^ "Swedishcharts.com – Bruce Springsteen & The E Street Band – War (Live)". Singles Top 100. Retrieved 2015-12-05. ^ "Bruce Springsteen Artist Official Charts". Official Charts Company. Retrieved 2015-12-05. ^ "Bruce Springsteen Chart History". Billboard.com. Billboard. Retrieved 2015-12-05. ^ "Gulliver's Travels Soundtrack". IMDb. Retrieved February 9, 2019.